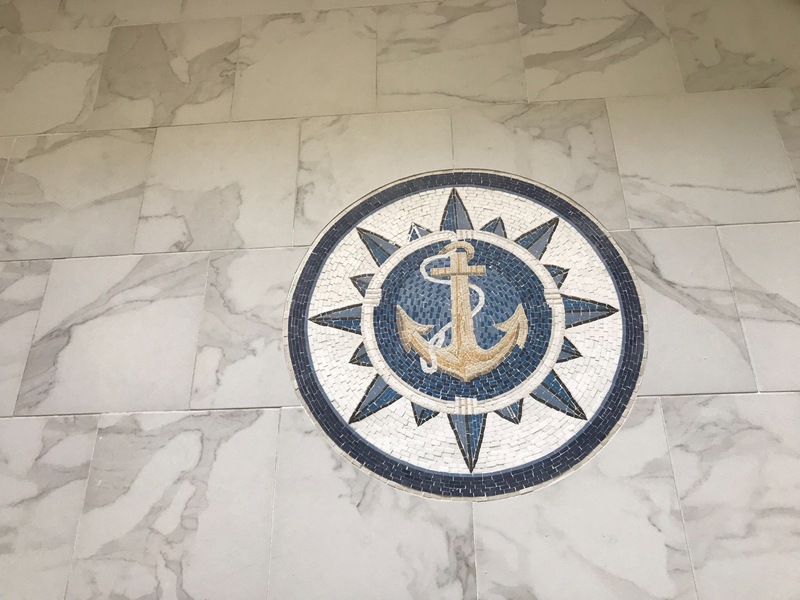 If you are or were a sailor or you have someone in your life who was a member of the Navy this anchor medallion mosaic art is perfect. It is a brilliant blue with a compass design surrounding the anchor. This truly unique mosaic art piece will stand out in any room of your house but it especially will look great by the pool. 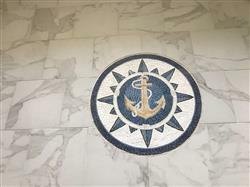 Do you like to see how Anchor on Blue Background Nautical Mosaic looks on your wall? This is the PERFECT touch to our bathroom remodel project. We live on a lake that flows into The Gulf of Mexico. What makes this Medallion extra special is it matches my husband’s gold charm he’s worn around his neck for 20 years. I have been wanting a special medallion for our floor, but never found the perfect one, until I came across Mozaic website. I immediately ordered it, hoping it would be a Quality product and arrive on time. After I ordered it, I learned it was coming from Lebanon. I was really stressed because I didn’t think it would arrive in time. Happily, the medallion arrived in time and it is a very Quality product. It only took about 9 days to get to me. When I unrolled the package, I couldn’t have been happier. It is a very beautiful Medallion and very well made. The tiles did not come off the backing in shipment. Each tile was in place. And, they sent many extra tiles too. This was a surprise for my husband and he was overjoyed when he saw it in the middle of our new tile floor. I would HIGHLY RECOMMEND MOZAIC to everyone. This is truly a HIGH QUALITY PRODUCT. It definitely is not cheap made or cheap looking.